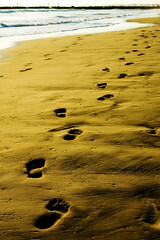 After walking along a beach, or through the snow, we see our footprints by looking back. We see how we have left an impression or imprint on the surfaces. With digital footprints though, we can decide and control the impression or the imprint we will leave. Unlike in the sand or snow, we have control over what kind of footprints we are going to leaving behind in the digital realm. This is an important idea to impart on students as they develop as active members of the digital world. In my very first blog post, “Intentions on the Internet,” I wrote a little about how students need to be mindful about how they participate in online communities. The idea of digital footprints come back to this idea. A mindful users will probably have a more positive digital footprint than those who are not. 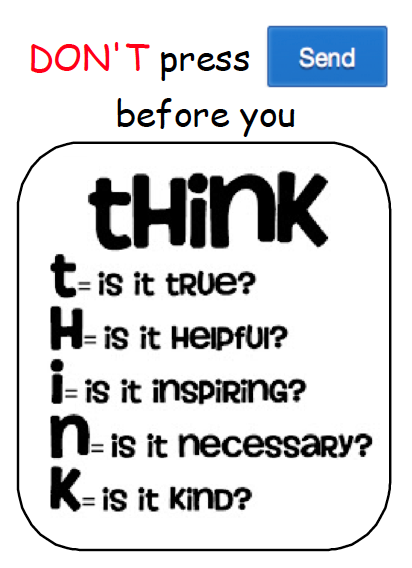 In my classroom, after introducing Edmodo to the students, I introduced the acronym, T.H.I.N.K. Adapted from technology rocks seriously. After a bit of digging (since so many websites talk about this acronym), I came across Girl Talk where they have a program called T.H.I.N.K. (maybe they are the creators?) Anyway, I thought that if all activities that the students have on the internet fit into this criteria, online communities will provide such a warm and positive space (quite utopian, I must say). So, I introduced this in my classroom and made it a requirement for all posts. Of course my students are making mistakes along the way, but I am very pleased with the online community they are forming on Edmodo and how they are participating with other groups (from the GRA) as well. When we email a class that we partnered up with, the students are the ones reminding me that we should read over everything to make sure that it fits the criteria. As a teacher in the classroom, we must continuously model this behavior and build our own digital footprint that reflect this idea. This is how students can be shown and taught to plan, construct and design their digital footprint. If everything that they leave behind online meets the T.H.I.N.K. requirements, what they can look back at and ahead into will inevitably be positive. Previous: Previous post: Global Collaborator… Fail…? Great! Your enthusiasm and interest in this topic is also probably part of their energy and thoughtfulness about how, what and why they post. It is amazing how much of our engagement in an idea comes right back to us through our students.